This Halloween book for kids is the perfect noisy book for the scariest time of the year. Are you daring enough to join the brave cat and mouse as they explore the noisy haunted house? If so, open the surprise flaps and hear the funny, light-activated sounds in this spooky sound book that's shaped like a house. With a delightful rhyming story to read aloud to little ones, a sliding door on the cover, and enticing flaps to lift inside, it's the perfect noisy Halloween gift for the scariest time of the year. 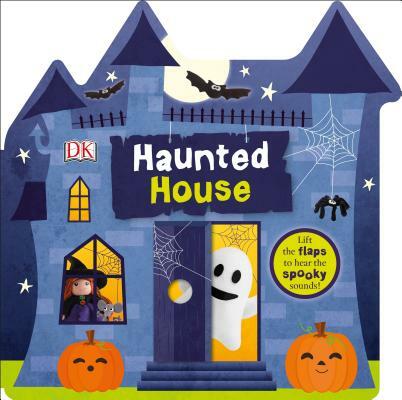 This interactive spooky house board book will appeal to a baby, toddler, or preschooler. When they push open the front door slider on the cover they find a friendly ghost, and hear some fun Halloween music and a ghostly woooh! Inside, they'll discover more entertaining characters under flaps to fill their Halloween with sound: a talking monster, a rattly skeleton, a smiley mommy with a silly scream, and chuckling Mrs Witch. Little ones will soon be joining in with the rhyming story, and they will improve their fine motor skills as they lift the exciting flaps and discover who's hiding behind each one. With its slider, lift-the-flap sounds, and fun shape, &lt;i&gt;Haunted House&lt;/i&gt; provides lots of opportunities for parent-and-child interaction, and hours of Halloween entertainment little kids will love.